Folks, following is my experience with the Napa in Washington, Pa. This situation is hard to believe. Unfortunately, not one person in this shop will do the right thing. I've been in the car business and hobby for near 40 years and never seen people so blatently dishonest. If you know someone in Napa who gives a hoot, and could help with this, please email me. Downstairs of the parts store Napa has a their machine shop. Running this shop is George & his wife, Delores Jones. I dropped off a 1967 Pontiac 400 block, heads, tin, and rotating assembly. I needed the block boiled, bored .40 over, & decked. The heads needed hardened valve seats, regrinding of the valve seats and valve faces, and valves re-installed with new springs and keepers. decked, cleaned, & new valve seals installed. Also needed new bearings, and freeze plugs etc. Crank shaft to be cleaned and polished. George claims to be a Pontiac specialist, Great! Before I left, George and I talked about him stopping by my place and bringing some of the tools I don't have and his Pontiac experience, he would make sure I was assembling the engine correctly. He agreed to do this for a reduced price, which I thought was very reasonable. I offered that we could make an evening of it, he could bring his wife, and we could cook a meal or order out ,and make some of his favorite chocolate chip cookies too. Well after being told it would take 2 month, it actually took 7 months. I found out from another customer, he was not only telling other people about my business with him, he was making me out to be a fool, for not knowing how to assemble the engine. He actually PRETENDED to be a friend, and had NO intention of coming to my place. Worse that that, what I received back was a joke. The heads were not decked, despite needing it, the block was not decked, the valve covers were crushed somehow, the heads were full of steel shot, the crank shaft had stuffed oil holes & was not polished at all, the original valve keepers were re-used, except for one, which was did not fit correctly, I'm guessing to replace one they lost. The oil galley plugs were replaced using white water pump bolt sealer, All the valves were ground by hand, not machine, leaving three of the completely ruined. The valves were re-ground and re-installed despite 3 valves being bent. On top of that the cam bearings were scratched up badly, and he had ordered parts I did not want. When I told George about the poor and incorrect work, he became defensive, and refused to admit anything was wrong. They offered to un-bend the valve covers, and I let them try, it didn't work, George got mad again, and his boss William then refused to pay for originals, despite that being exactly what I had. They gave me under a hundred dollars to buy aftermarket covers, and that is all they refunded me. As for the rest of the work done wrong or not at all, William the owner said, sue me. Then he and George said they would bring people to testify against me! There is actually more to this, and it is worse than I wrote here, but this is the basic problem. I had to take the block, heads, and crankshaft to an engine shop in Uniontown, and re-spend the money to get the work I already paid Napa for. Wow, that's ridiculous that it took so long and they didn't even do a good job. 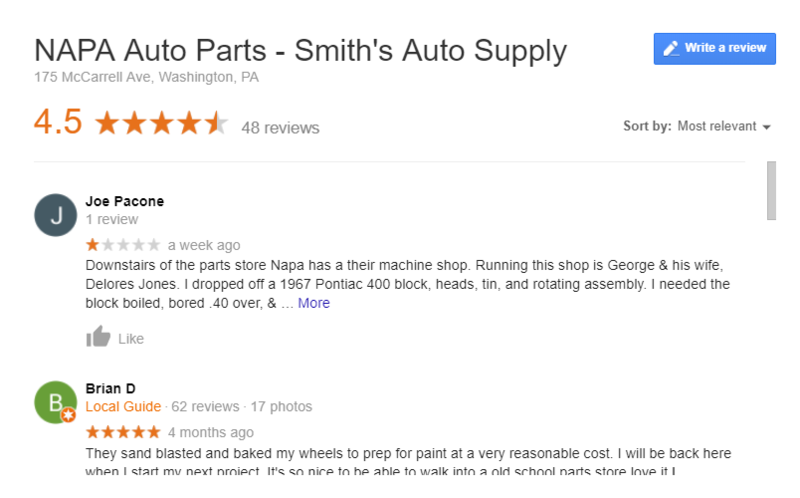 Looks like it's Smith's Auto Supply in Washington Pa. When you see that, it's a Napa independent and not a Napa corporate store, so they run their own business with distribution from Napa. Looks like you gave them a negative review already, that's too bad they couldn't make it right for you. Are there any other machine shops and parts stores in the area?